INDIANAPOLIS – Most seem to agree that Indiana teachers don't get paid enough. But the disconnect comes in where the blame lies. Is the legislature not providing enough money? Or are school districts spending too much on administration and too little on teacher salaries? As lawmakers near finalizing a two-year budget that will fund school salaries, The Journal Gazette reviewed collective bargaining agreements for all 33 school districts in northeast Indiana for the 2017-18 school year, the most recent data available online for all schools. 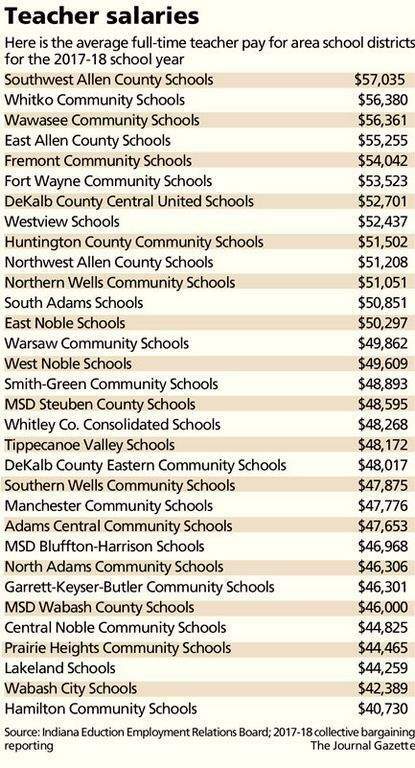 The reports showed a wide range of full-time teacher pay between $32,834 in Central Noble Community Schools to $72,696 in Fort Wayne Community Schools. None were at a minimum starting salary of $40,000 suggested this session by Democrats, but a few were close. All but four gave base salary raises that year and some also gave one-time stipends. “They need to own up to the fact that they have underfunded Indiana's children,” said Phil Downs, superintendent at Southwest Allen County Schools. He said since the legislature took over most property taxes and full responsibility for teacher salaries in 2009, the state general fund budget has grown 21 percent; inflation by 17 percent and education spending by 12 percent. Downs said it's on lawmakers to give more and schools will follow through crafting the best salaries for the area. Salary is a top reason for teacher shortages – here and nationally. According to the National Education Association's website, Indiana teacher pay ranges from $24,000 to $90,000, with the average being $54,308. Nationally, teacher pay is 5 percent lower than it was in 2009, adjusted for inflation, according to the U.S. Department of Education. In Indiana, teachers now earn almost 16 percent less than they did two decades ago. Whitko has one of the highest average salaries in the area at $56,380. This year the district targeted raises for teachers with between six and 14 years of experience who initially got into education when a specific salary schedule existed. Now all of those teachers make $41,000, Penrod said. And health care premiums went down. But he said it will be hard to give raises next year under the budget being considered now. The initial House proposal shows Whitko losing more than $100,000 – ostensibly because it will have fewer students. But Penrod said losing 47 students over 13 grades isn't enough to reduce the number of teachers. He noted the district in the past few months cut $110,000 in administrative costs, but utilities and other expenses are still rising. “We have been conservative on increases to help maintain financial stability for the district,” he said. He said it costs the district about $36,000 for every 1 percent in increased teacher wages, including taxes and retirement. Fort Wayne Community Schools has given raises most years – the most recent being an $1,100 increase, a 1.6 percent to 2.8 percent increase. Sometimes FWCS – and others – rely on increasing one-time stipends. Statewide, districts spent $22.3 million on stipends in 2017. That was up nearly 14 percent year-over-year. By comparison certified salaries went up 1.9 percent, to $3.3 billion. FWCS spokeswoman Krista Stockman said stipends are attractive because they are not a continuing, ongoing cost that schools are tied to should funding change or come in less than expected. Similarly, lawmakers usually give a one-time 13th check to state retirees along with the 12 monthly payments rather than a base cost-of-living increase. She and others are adamant that lawmakers should not be mandating certain wages or pay increases. And some districts have taken advantage of outside referendums to provide pay increases when they think lawmakers have not stepped up. Smith-Green Community Schools Superintendent Daniel Hile said his voters last spring approved an eight-year referendum that allowed $1,000 teacher pay raises. A failed referendum would have forced Smith-Green to make about $600,000 in cuts before the 2018-19 year, and additional cuts would have been required in the future, Hile said last year. “It certainly does help our budget now that we have those funds available,” he said.